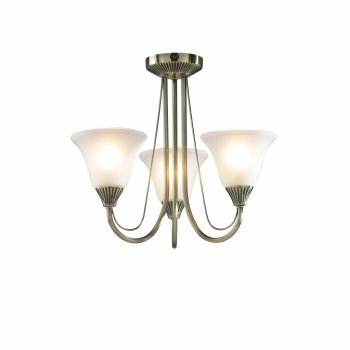 Dar Lighting Boston semi-flush 3 light ceiling fitting with swing lock for improving value and convenience. Also features acid etched glass shade mounted on curved arms supported by a antique brass circular wall plate. The product code for this Dar Lighting fixture is BOS03, however if you prefer a 5 light ceiling fitting "BOS05" search the product code in the box above. The product code for this Dar ceiling fitting is BOS03. 'Swing lock' refers to the fitting when fitted, the arms lock into position, making for a better looking light. An antique brass finish combined with acid etched glass adds a traditional feeling to the fitting. If you are looking to complete the look in your room, we also stock a range of table lamps "BOS40", wall lights "BOS07" and floor lamps "BOS49" in the same style.